trends | See. Like. Blog. Ladies and gentlemen, I present to you my favorite of-the-moment pattern for that seamless transition into the autumnal season; I have reverted back to my 7 year old self, cannon balling off the deep end of the sartorial pool. I am officially crazy for daisies. Why, you might ask, am I so infatuated with a simple, graphic floral usually reserved for OshKosh catalogues and playgrounds? First off, we have punk making a major comeback thanks to the influential Met Gala this past spring, showcasing the exhibition that honored the movement. While daisies don’t exactly scream “REBEL WITHOUT A CAUSE” spray painted across a wall, try this: picture pairing a daisy patterned dress with a pair of beat up black Doc Martens, a plaid bomber jacket and an assortment of scattered safety pins. The pattern is versatile enough to go from girly to edgy depending on your mood of the day. One minute you could be Mandy Moore, the next Avril Lavigne, both circa early 2000s. Second, it’s just damn fun! As most of you already know, I am never one to shy away from the playful, quirky and just plain odd pieces that make up a large part of my wardrobe. The worst fashion crime a person can commit is taking themselves (and their outfits) too seriously. Live a little! 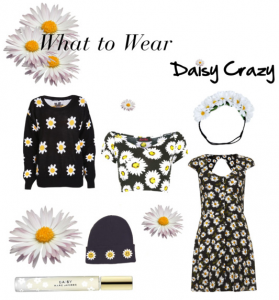 The occasional daisy print will not kill you; in fact, I’d be willing to bet it might just put a smile on your face. And this season, I can’t imagine anything better than smiling in a daisy print. More fall fashion, fresh florals and adventures to come. Here are a few things on my wish list for October! I feel like the cat sweatshirt goes without saying — cool weather and an infatuation with everything feline makes this sweatshirt the coolest thing since sliced bread. Paired with a spiked headband inspired by a Fashion Week look from one of my very favorite bloggers, Peony Lim, I am determined to push the envelope between what’s crazy good and just plain crazy. Blurring that line is half the fun of putting an outfit together. If I’m feeling ambitious, I may attempt to DIY the headband with instructions I found here. On the more conventional side of my sartorial desires of the month, I am definitely searching for a pair of black wax jeans — I feel like they offer the edge of leather pants while remaining a bit more practical for every day wear. I am also on the hunt for some floral booties and a bright orange satchel. Normally towards the middle of October my wardrobe starts to drift towards the monochrome color scheme in shades of white, grey, and of course, black. I want to keep color in my wardrobe through the fall and winter months, and what better way to do this than an orange satchel? Orange is a great color for summer to fall seasonal transitions because it is everywhere right now — the leaves on the trees, the pumpkin in my Pumpkin Spice Latte and the stripes in my candy corn. I love finding inspiration in unexpected places. Tomorrow I am headed to my first ever CapFABB meet up and I couldn’t be more excited! I will have my camera on me for the whole day, cannot wait to share the event with you guys. Hope everyone has a fantastic Friday!